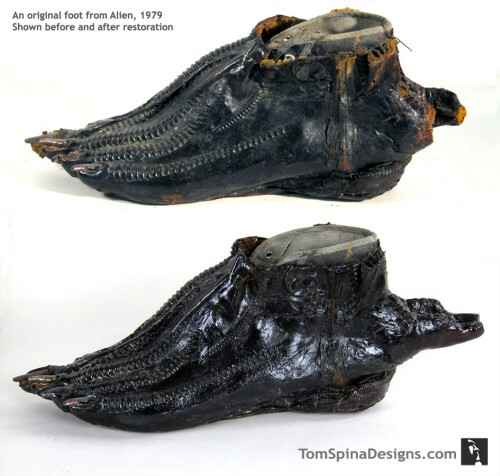 A subtle restoration of a pair of original Alien costume feet from Ridley Scott’s 1979 classic sci-fi thriller Alien. These latex Alien costume feet were in need of some subtle preservation work, performed by artist Mike Thomas. 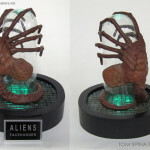 HR Giger’s classic alien design from the movie was a huge influence on our artists and it was very cool to work with original movie props from that film. Our first job was to carefully clean the movie prop feet, which sounds easy, but can be a time consuming process. 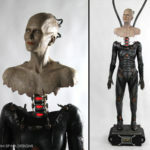 Aging latex movie props can be quite fragile and cleaning costume pieces with out causing any additional damage is often a challenge. 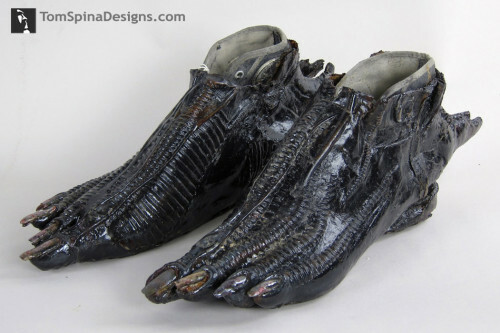 With these Alien feet, for the most part the repairs were fairly minor. The biggest repair was the rebuilding of the heel “tubes” on the left foot. 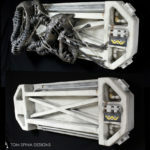 We carefully sculpted the new tubes using photos from the movie as reference (as well as referencing the right foot) to help us recreate the missing material. 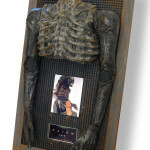 The patches and new heel tubes were painted to match the aged paint of the original 1979 era Alien costume shoes. 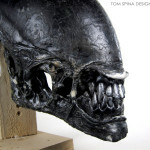 The entire alien feet were also coated with a sealer to help bind smaller cracks and hole flaking paint in place. Fun fact… If you look closely at the photos you can see that these feet were actually built around a pair of Converse high top sneakers!